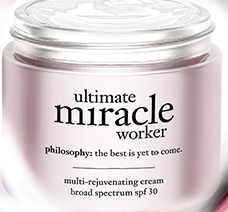 Score a FREE sample of Philosophy Ultimate Miracle Worker Cream! Just head on over to the link and fill out the easy form to request your freebie! Allow 2 to 4 weeks for delivery. This sample will arrive as a "foil on card" sample.